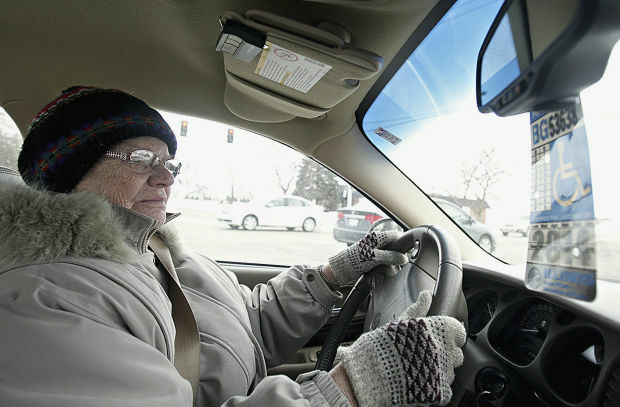 In this Jan . 24, 2014 photo, Dorothy Bierman, 86, makes a right turn while driving in DeKalb, Ill. Discussions about giving up one’s driver’s license are difficult for senior citizens. Bierman, who has been driving for 70 years, has a supportive son who has taught driver’s education to high school students. DEKALB, Ill. | Nikki Crooke of DeKalb plans to keep driving until they tell her she can’t any more. Crooke, 79, of DeKalb, said she would feel a terrible loss of independence without her driver’s license. Discussions about giving up one’s driver’s license — and with it a measure of independence — are difficult for senior citizens. According to the National Highway Traffic Safety Administration, 5,401 people age 65 and older were killed and 185,000 were injured in motor vehicle traffic crashes. These older individuals made up 17 percent of all traffic fatalities and 8 percent of all people injured in traffic crashes that year. Seniors, and those who care for them, need to have discussions about driving, advised Diana King, senior service director for Family Service Agency. But it’s not always an easy one. Factors that contribute to safety issues for seniors include slower reaction time, depth perception changes, vision or hearing problems, decreased ability to focus, feelings of nervousness or anxiety and general medical issues. King said some refuse to give up their keys, and that’s when it gets difficult. Dorothy Bierman, 86, of DeKalb, still drives and has a supportive son who has taught driver’s education to high school students.